ÌÌ HoMage, Montreal, QC, Gestion KnighstBridge ÌÌ La Géode, Montreal, QC ÌÌ Le Jardinier, Montreal, QC, Gestion Knightsbridge ÌÌ Les Maisons Roco: 2748 des Érables, La Conception, QC, Les Maisons Roco ÌÌ MatAna, Saint-Charles-Borromée, QC, Les Entreprises Christian Arbour ÌÌ Matco Investments Ltd. Head Office, Calgary, AB, Matco Investments Ltd.
SILVER ÌÌ Faubourg Cousineau: 4280 Bernard-Hubert	St-Hubert, QC, Habitations Lussier ÌÌ Faubourg Cousineau: 4300 Bernard-Hubert	St-Hubert, QC, Habitations Lussier ÌÌ Faubourg Cousineau: 8090 Arlington	St-Hubert, QC, Habitations Lussier	ÌÌ General Mills, Mississauga, ON, WSP	ÌÌ Gordon Oaks Red Bear Students Centre, Saskatoon, SK, University of Saskatchewan ÌÌ Grimshaw Shared School Facility, Grimshaw,	AB, Peace River School Division #10 and Holy Family Catholic Regional Division #37 ÌÌ Harbour Landing Business Park Building 3000, Regina, SK, Harbour Landing Business Park Ltd. ÌÌ Harriet Brooks Building, Chalk River, ON, Atomic Energy of Canada Limited ÌÌ i spa-us ki-low-na, Kelowna, BC, Innovative Housing ÌÌ Iron Ridge Intermediate Campus, Blackfalds	AB, Wolf Creek School Division No. 72 ÌÌ Ivor Dent School, Edmonton, AB, Edmonton Public School Board ÌÌ Joussard School, Joussard, AB, High Prairie School Division No.48 ÌÌ Kensington Village Long-Term Care Building, London, ON, Kensington Village ÌÌ L/Avenue commercial, Montréal, QC, Bentall Kennedy (Canada) LP ÌÌ Lake Vista Public School & Holy Mary Catholic School, Martensville, SK, Government of Saskatchewan ÌÌ Lakeshore Campus Fitness Centre, Toronto	ON, Humber Institute of Technology & Advanced Learning ÌÌ Lansdowne Park Redevelopment, Ottawa	ON, Minto Properties Inc. ÌÌ Le Cent 12 - Bâtiment 3, Saint-Hubert, QC, DMI Saint-Hubert INC.
Developer/builder POLYCORP is known for extraordinary energy efficiency. Its latest project, Q Lofts, raises the bar even further, illustrating the company’s mandate to treat energy as a valuable resource that needs to be managed and optimized through smart design choices. suites and common areas. Combined with low-VOC hard flooring and paint, and formaldehyde-free cabinetry and trim, Q Lofts has superior air quality. Rainwater for use in toilets is collected from the building’s roof and stored in the 45,000-litre cistern under the garage floor, vastly reducing the load on the municipal water supply. Q Lofts also has low-flow fixtures and an exterior native foliage landscape requiring little-to-no irrigation. LED lighting throughout the building, motion sensors in the garage and mechanical rooms, and EnergyStar rated appliances, bathroom exhaust and ceiling fans all reduce electrical consumption. The icing on this Platinum cake is the impact these leading-edge and thoughtful energy efficiency measures have had on the Owners at Q Lofts: they enjoy the lowest condo fees in Halifax – by a wide margin. 4711 Yonge is a leader in sustainability, pursuing the highest standards of social, employment, and environmental practices, striving to make the community in which it operates a better place to live and work. 4711 Yonge has not only proven to be a consistently high-performing building, but it has continued to raise the bar for sustainability best practices. 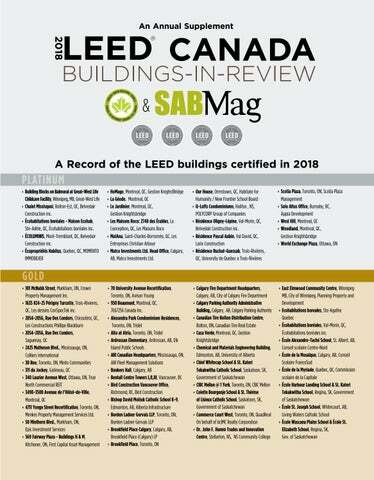 It initially achieved LEED Canada EB:O&M Silver certification in 2013, and has now upgraded to LEED Canada EB:O&M Gold, a remarkable achievement for a suburban office building. Over the past 10 years, 4711 Yonge has implemented an Energy reduction strategy to dramatically cut energy consumption and decrease associated GHG emissions. EUI has decreased by 31% while the ENERGY STAR score increased dramatically from 45 to 89, a major feat for a building that is over 30 years old. These significant energy reductions were not through a single upgrade but through strong leadership at the property, and a continuing drive to improve performance. With a strong commitment to sustainability, the building has made significant cuts to energy, water, and resource consumption while setting an industry example for implementing well-being initiative for its occupants. Additional certifications and accolades include: BOMA Certificate of Excellence, BOMA BEST Platinum, Fitwel Certification, ENERGY STAR Certification and Wiredscore Gold Certification (2018). This impressive 30-year-old building continues to stand the test of time, keeping pace with towers half its age. PARK PLACE At almost 460 feet high and more than 700,000 square feet, Park Place is the largest leasable office space in British Columbia. Built in 1984, this iconic AAA tower located in the heart of Vancouver’s downtown business district is well known for its pink granite façade and copper-glazed windows. It is also a clean giant with LEED Gold and BOMA BEST Platinum certifications. In 2018, it was awarded ENERGY STAR certification, one of the first buildings in Canada to do so. This technology makes it possible to heat the entire building solely with the heat recovery chillers when outside air temperatures are above 7°C. An important goal for QuadReal is to improve and invest in existing buildings so that they remain competitive with new commercial properties, while creating comfortable environments that enhance the lives of tenants and guests. Park Place is proof that older buildings can meet and exceed the performance of new ones. Driven by long-term financial and environmental considerations, many successful energy upgrades have taken place at Park Place. The latest was the installation of a heat recovery chiller that allows waste heat from cooling systems to be captured and re-used to heat other parts of the building. Valued at over $200 million, Edmonton Tower is a 618,000 square foot glass edifice that sits in the heart of the busy ICE District and ascends 27 floors into the sky. This AAA commercial office development has a unique curved façade, dramatic floor-to-ceiling perimeter glazing, expansive floor plates, a grand public lobby, a childcare service with accessible pick-up and drop-off from the parkade, a public art on display outside the building, and pedways leading to downtown amenities. With unparalleled features and comforts, this transformative project is home to over 2,000 hard-working Edmontonians and is a testament to our team’s dedication to quality and community. A reduced carbon footprint was a key goal of Edmonton Tower. The project team emphasized sustainability in the following areas: urban densification, energy efficiency, and building materials. While adhering to strict sustainability regulations and standards, this project, despite urban constraints, excelled in both continuous efficiencies and long-term viability. Edmonton Tower achieved LEED® GOLD Core and Shell certification and through the design and construction features included to meet this target, also supported the LEED® Commercial Interiors certification for at least two major tenants, one being the City of Edmonton. 101 MCNABB STREET, MARKHAM 101 McNabb Street is a 1980’s vintage office building owned by Op Trust Office Inc. and managed by Crown Property Management Inc. The 315,000 sq. ft., 3-storey building, occupied by General Motors (GM) and TD Bank, was renovated in 2015 from a single-user building to accommodate a multi-use tenancy. An ASHRAE Level II Energy Audit resulted in adjustments such as optimizing the operating hours of the air handling units, upgrading controls of the cooling plant, and replacing exterior lights with LEDs. The building has an impressive EUI of 23.7 ekWh/sf, helping it to achieve an Energy Star score of 86. Moreover, Crown has reduced the building’s EUI by 45% since 2014 through upgrades to building systems and scheduling, and by working with its tenants to implement local occupancy and daylight control strategies and use of low power tenant equipment. The building provides 66 solar-powered electric vehicle charging stations for GM’s Canadian Technical Centre, and a private shuttle service to transit hubs. Crown also updated practices to meet key LEED requirements in the indoor environmental quality category. It aligned its preventative Indoor Air Quality (IAQ) assessments with I-BEAM requirements, adopted green cleaning practices, and installed MERV 13 filters and entryway mats to mitigate IAQ contaminants. Low-flow fixtures have achieved a water use reduction of over 37% compared to baseline. This accolade distinguishes 101 McNabb Street as a top-in-class facility exceeding industry best practices and showcases Crown’s dedication to responsible and efficient building operation and ongoing improvement. The building design responds to the prairie style design guidelines established for the industrial park and showcases a rain garden as a demonstration of stormwater management techniques. The building, which certified LEED Gold, is centered around shared services and operational functions. The building employed a complex series of sustainable initiatives to reduce the building’s dependency on the city’s utility infrastructure, effectively reducing the overall capacity needs of a fire station down to that of a large house. This resulted in significant reductions in potable water use, reductions in effluent volume needs, and storm water management impact on city storm sewers. The building also includes the use of solar panels, LED lighting, solar tubes, light shelves and efficient mechanical systems all contributing to an overall reduction in energy consumption. We use a third-party energy consultant company to monitor our energy consumption and we review the energy reduction recommendations monthly. We have implemented green initiatives such as a waste recycling program, water-conserving plumbing fixtures, a cycle loan program, EV charging stations, and e-waste recycling that includes batteries, lamps and ballasts. In 2018, we did an LED retrofit for the exterior lighting. Through our waste and recycling program, we saved 2,301 litres of oil, 42,397 litres of water, and 5 CU MTs of landfill space. As a result of this program, we also saved 6,560 KWh of energy and reduced 43KGs of pollutants. Active tenant engagement is also a key part of drawing awareness to our ongoing sustainability efforts. This includes activities such as the EcoChallenge, which encourages tenants to reduce their environmental impact and raises awareness of energy and waste reduction efforts. Serving the Northeast region of Ontario, the Ministry of Natural Resources and Forestry’s Fire Management Headquarters (MNRF) in Haliburton Ontario is a single-storey 1,750 s.m. (18,800 sq.ft.) facility situated on a 3.14 hectare parcel of land at the Stanhope Airport. Certified LEED® Gold® by the Canadian Green Building Council (CaGBC) in 2018, this state of the art, post-disaster facility and associated site developments incorporate numerous sustainable design principles, materials and building systems. The proportion of the available site at the Stanhope Airport, necessitated a long linear building footprint, carefully positioned between the geothermal field beds and parking areas to the north and the MNRF fixed wing aircraft and helicopter parking pads and asphalt taxi area to the south. Planned, designed and constructed to accomodate the MNRF’s demanding staff, training and first response needs, this facility consolidates all Northeastern operations under one roof. Interior space planning of the building is sensitive to airside and groundside operations typical of airport facilities with administrative and training spaces generally separate from warehouse, storage and service-type spaces. Office, administrative and training spaces capitalize on natural light views to the exterior and solar heat gain in the winter months, with generous roof overhangs sheltering these spaces from the unwanted heating effects of the summer sun. The building’s mechanical system design incorporates numerous heating and cooling zones allowing for maximum temperature control relative to building occupancy as it fluctuates seasonally between peak summer months and the firefighting low season. – Larocque Elder Architects, Architectes Inc.
LONDON CITY CENTRE London City Centre owned by DREAM Office Reit, achieved ISO 14001 certification in 2012; won the London Mayor’s Sustainable Energy Council award for significant reduction in electricity use as nominated by London Hydro in 2015; BOMA’s Best Platinum certification and National Office Building of the Year in 2016 and Silver LEED certification in 2018. The efficiency transition of the 48 yr. old, 540,785 sq. ft twin tower complex began half a decade ago to include retrofitting all air handling units with energy efficient motors; installing variable frequency drives; replacing original pump systems with high efficiency units and 50,000 flourescent tubes with new energy lighting; investment in solar harvesting; replacing the original 3,900 windows with low emissivity argon double glazed ones; sealing the entire exterior structure with elastomeric paint; achieving 86% diversion rate in recycling organics, electronic waste, cardboard, batteries, paper shredding, metals and air handling filters; culminating in 2018 with new entrance doors and podiums. We are working towards achieving 86% transition to hands free toilets and faucets to reduce water consumption. An integral part of London’s downtown, London City Centre supports numerous on-going charties and community initiatives such as Heart and Stroke, Canadian Cancer Society, the London Humane Society. Holding blood, food and toy drives, participating in Tim Horton’s camp day and hosting annual repelling events benefitting the Make-a-Wish organization. THE ELEMENT Inspired by Westin, the Element is transforming the extended stay segment with bright, modern design, eco-conscious practices and an innovative guest experience that resonates with todayâ&#x20AC;&#x2122;s traveler. From spacious guest rooms featuring fully equipped kitchens to spa-inspired bathrooms, guests have space to live their lives. Element is a smarter, better place to stay. The LEED certified Element Calgary Airport 142 rooms offer many unique amenities such as a complimentary health conscious breakfast, in-room filtered water, apartment size fridges, and induction cooktops to prepare meals in the comfort of your room. Other hotel features include a heating swimming pool, steam room, large fitness facilities, complimentary internet, and EMV charging stations. Discover a new way to relax, refresh, and connect with the world around you. The City of Vaughan continues to promote innovative, sustainable and accessible facilities such as the award-winning Civic Centre Resource Library for Vaughan Public Libraries. The Civic Centre Resource Library (CCRL) received LEED Silver certification in June 2018. The 3,306-square-metre building was designed to promote literacy, community outreach and environmental stewardship through its expansive views, open space design and interior courtyard. The library is home to more than 70,000 books and provides services to 20,000 residents every month by offering amenities such as a study hall, reading lounge, computer lab, children’s area, creative suite and an upper reading patio with access to natural lighting. The CCRL was constructed with a high albedo roofing system and efficient LED and motion sensor lighting that helps conserve energy when rooms are unoccupied. It features mechanical and electrical systems that control ventilation and variable speed fans to ensure efficient operation; and high-performance glazing that reduces solar heat gain and glare. These energy efficient measures, among others, are projected to reduce energy consumption by 33 per cent. Water is conserved through low flow plumbing fixtures that reduce the amount of potable water consumed by 37 per cent, in addition to drought-tolerant landscaping and native plants that require little to no water. The building’s waste reduction efforts include refillable water stations and the adoption of recycling services. This successful project promotes active and sustainable transportation by offering bike racks, two electric vehicle charging stations and easy access to public transit, including York Region Transit, TTC bus routes and Maple Go station. A comprehensive education outreach program was developed that includes a guided tour of the building which identifies key design features that improve the overall environmental impact of the project. 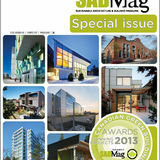 The building is also included on the City of Vaughan’s Green Buildings website.